Easter decorations made of egg shells and egg packaging are popular craft ideas before Easter. Creative and unique Easter ideas and recycled crafts offer wonderful ways to recycle egg shells or egg packaging and make original Easter decorations of empty egg shells, egg shell pieces and recycled paper, adding an artistic touch to gorgeous spring holiday decor. Easter decorations made of egg shells and egg packaging look great on the window sill and doors, make charming Easter table centerpieces and decorations for walls, bringing Easter characters, symbolic meaning and fresh ideas into traditional holiday decorating. 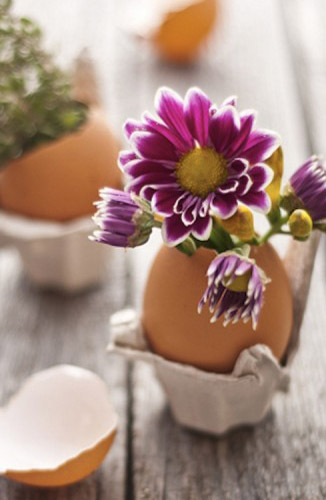 Egg shells are a natural material for Easter crafts, perfect for eco friendly Easter decorating. 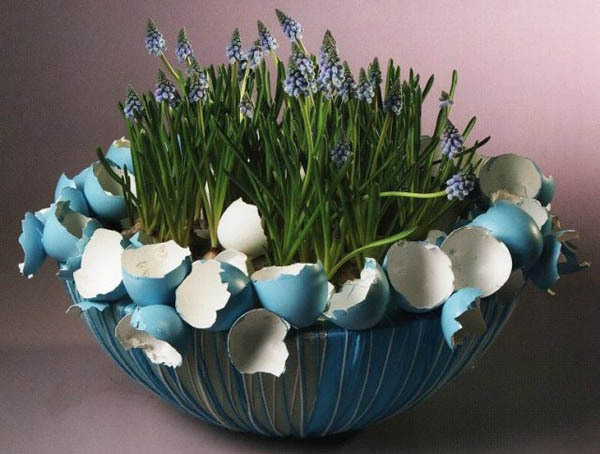 Garlands and nests, floral table centerpieces and hanging decorations, made of empty egg shells and egg packaging bring unique textures, bright colors and organic shapes into modern homes. Egg shells can be used for making candle holders and mini containers for sweet treats. Decorative vases made of egg shell halves, combined with short fresh flowers, make charming floral table centerpieces and decorations for window sills that brighten up Easter decor. 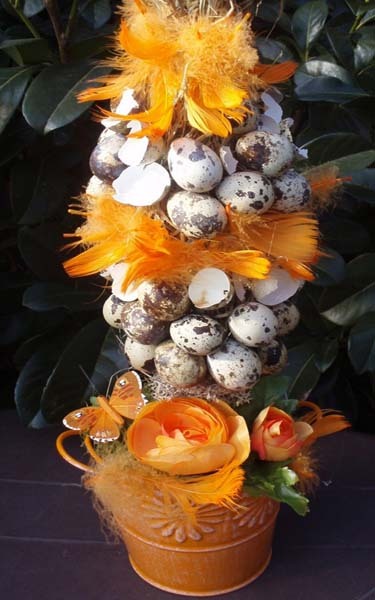 Decorating Easter baskets or creating dramatic table centerpieces with egg shell halves and colorful feathers are exciting and unusual Easter ideas that add surprising details to Easter decorating and make Easter table decor look unique, impressive and eco friendly. Spring greens looks very nice, fresh and festive on Easter table in egg shells. 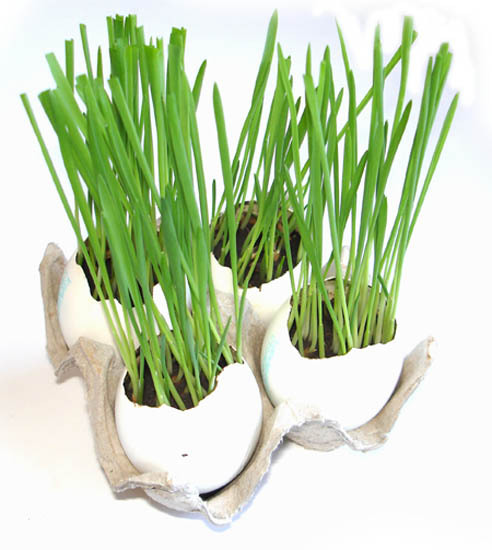 Growing green grass, moss or small onion bulbs in egg shells is one of simple and elegant Easter ideas that symbolize life and make this spring holiday celebration truly symbolic and green. You need just little soil for planting flower seeds, wheat grains or small onion bulbs, and about a week for growing beautiful and meaningful Easter decorations for your party table. Prepare empty eggs shells and egg packaging. Mix the soil with seeds or cereal grains in equal proportion. Fill each egg shell with a tablespoon of the mixture. Keep egg shells in a sunny place. Water daily. 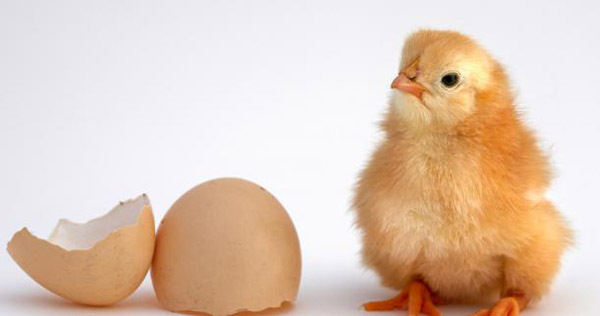 You can paint funny faces or Easter Bunny, chicken, hen or carrot images on egg shells while waiting for greens to grow.